This dish may not sound like much, but it is absolutely delicious and incredibly satisfying. And it’s meat-free! Twenty minutes before the rice is done, heat the oil in a large skillet over medium-high heat. Add the tomatoes, cut-side down, and cook, shaking the pan occasionally, until browned and starting to soften, 3 to 5 minutes; turn and cook for 1 minute more. Transfer to a plate. Reduce heat to medium and add the chard, raisins, garlic, 2 tablespoons water, ½ teaspoon salt, and ¼ teaspoon pepper to the skillet. Cook, tossing, until the chard wilts, 2 to 3 minutes. Return the tomatoes to the skillet, add the chickpeas and lemon juice, and toss until heated through, 1 to 2 minutes. Serve over the rice. My love for Crock-Pot recipes is well-documented, and this one was no disappointment. Because the main protein is chicken (rather than, say, beef short ribs or pork shoulder or something like that), the dish seemed a lot lighter and was perfectly enjoyable even on a warm evening. Note: not only can it be difficult to find boneless/skinless thighs, they are also usually much more expensive than their bone-in/skin-on counterparts. I buy regular chicken thighs in bulk, on the cheap, and then just skin and bone them as necessary. In a 4- to 6-quart slow cooker, whisk together the tomato paste, garlic, curry powder, ginger, cumin, and ¾ cup water. Add the onion and stir to combine. Place the chicken on top and season with 1 teaspoon salt and ¼ teaspoon pepper. Cover and cook until the chicken is tender, on low for 7 to 8 hours or on high for 3 to 4 hours (this will shorten total cooking time). Just before serving, add the yogurt and ½ teaspoon salt to the chicken and stir to combine. Serve with the rice and sprinkle with the scallions. This recipe had all the trappings of a weeknight success story – it was simple, it didn’t require a ton of ingredients (and most of them were already in the fridge or pantry), and it utilized flavors that my husband and I both enjoy. 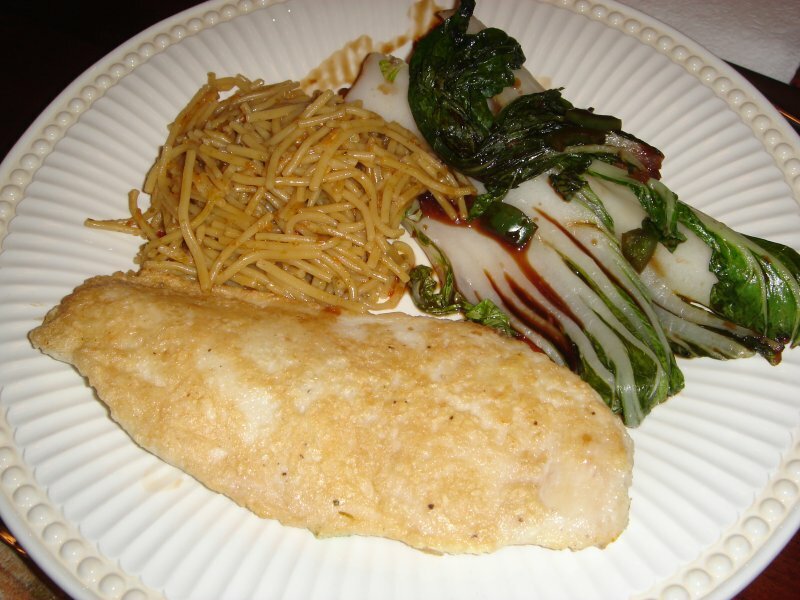 I was also optimistic since the idea came from Real Simple, which is usually a good source for easy dinners. Well, the idea was a lot better than the actual end product. The meatballs were pretty tasty, but the soup…well, it tasted like pureed salsa (which is not a good thing). Perhaps if you subbed chicken stock for the water it might balance the flavors – but overall, I feel like there are definitely better soup recipes out there. Heat broiler. In a bowl, combine the beef, scallions, tortilla chips, cilantro, cumin, ½ teaspoon salt, and ¼ teaspoon pepper. Shape the mixture into 1-inch balls (about 24) and place on a broilerproof baking sheet. Broil until beginning to brown, 5 to 6 minutes. Meanwhile, in a blender, puree the salsa with 1 cup water. Transfer to a large saucepan, add 2 cups water, and bring to a boil. Add the meatballs, reduce heat, and simmer until cooked through, 2 to 4 minutes. Serve the soup with the avocado, cilantro sprigs, and tortilla chips, if desired. I admit, I was skeptical of this Real Simple recipe from the start – after all, it called for a ketchup-based glaze. Much to my surprise, however, the ketchup (combined with the honey and chili pepper) kept the pork super moist and added a unique and tasty flavor. This is a great weeknight meal – quick (and there’s not a lot of active prep/cook time), easy, healthy, and tasty. I personally loved the slaw, but even though I halved the amount of cilantro suggested by the recipe, my dining companions were still a bit overwhelmed by that particular flavor. So, if you’re not a fan, maybe you can leave the cilantro out altogether and substitute a different herb (basil might work, as it has that same refreshing quality). If you want to cut the prep time even further, buy pineapple that has already been peeled and cored. It will be more expensive, but it definitely streamlines the process. Enjoy! Heat oven to 400° F. Heat 1 tablespoon of the oil in a large ovenproof skillet over medium-high heat. Season the pork with ¼ teaspoon each salt and pepper and cook, turning occasionally, until browned, 6 to 8 minutes. Make the glaze: In a small bowl, combine the ketchup, honey, and chili pepper. Brush the pork with half of it, transfer the skillet to oven, and roast, turning once, until the pork is cooked through, 10 to 12 minutes. Brush with the remaining glaze and let rest for at least 5 minutes before slicing. Meanwhile, in a large bowl, combine the jicama, pineapple, bell pepper, cilantro, lime juice, the remaining tablespoon of oil, and ¼ teaspoon each salt and pepper. Serve with the pork. * Sorry for the lack of photos (in this and other future posts) – my camera went through a little cranky phase, and I lost a bunch of pictures. Bummer! Seriously, I feel like it’s been cold and rainy (if not icy and snowy) since Thanksgiving. And the worst of the weather seems to hit right smack on the weekends, which is when I want to get out and play with my dog and get some fresh air. Stupid mother nature. Cold weather is good for one thing – SLOW COOKING. There is very little better in this world than coming home from a long day’s work and a nasty commute only to find a warm, comforting, good-smelling creation waiting for you in the slow cooker. And all you have to do is throw some stuff in the Crock-Pot and turn it on! The slow cooker really is a great weeknight convenience, especially when used to create great dishes like this one. This recipe could not be easier, and the end product was absolutely delicious. Sweet and spicy and tender and rich, the pork shoulder was perfectly seasoned and super-duper meaty. The bok choy added a nice fresh crunch (make sure you don’t add it too early, or it will be overcooked and soggy), and basmati rice soaked up all the juicy goodness. If you’re looking for something warm you up this weekend, this dish will definitely do the trick. Stay safe, everyone! In a 4- to 6-quart slow cooker, combine the soy sauce, sugar, chili-garlic sauce, ginger, five-spice powder (if using), ½ teaspoon salt, and ¼ teaspoon pepper. Add the pork and toss to coat. Cook, covered, until the pork is tender, on high for 4 to 5 hours or on low for 7 to 8 hours. Meanwhile, skim off and discard any fat from the pork. Gently fold the bok choy into the pork and cook, covered, until heated through, 2 to 4 minutes. Serve with the rice and sprinkle with the scallions. Happy 2010 to everyone! So, are we calling this year two thousand and ten, or are we calling it twenty ten? Whatever we’re calling this year, I am starting it (only a few days late) by eating healthy. I know, I know, EVERYONE says that they’re going to eat healthy and lose weight and get in shape and lose a zillion pounds. But, at least for me, eating healthy is something that I strive to do on a regular basis, and I know I can do it. This is a recipe I tried out about two months ago, and it definitely fits the bill for healthy eating. Note the use of super-flavorful ingredients like ginger and jalapeno, which both allow you to add flavor without adding a ton of fat and calories. If you like the chicken but want a little something different, it is also really tasty when sliced on top of a salad (also a great use for leftovers, if you have any). Enjoy! In a bowl, whisk together the egg whites, sesame seeds, ¼ cup of the cornstarch, ½ teaspoon salt, and ¼ teaspoon pepper. Dip the chicken in the batter and shake off the excess. Heat 2 tablespoons of the oil in a large nonstick skillet over medium-high heat. Add half the chicken and cook until golden brown and cooked through, 2 to 3 minutes per side; transfer to a plate. Repeat with 1 tablespoon of the remaining oil and the remaining chicken. Heat the remaining tablespoon of oil in a large skillet over medium-high heat. Add the bok choy and cook, turning, until just beginning to soften, 1 to 2 minutes. Add the soy sauce mixture and jalapeño and cook until the liquid has thickened slightly and the bok choy is tender, 3 to 4 minutes. Serve with the chicken. While most of my cocktail party prep/cooking went off without a hitch, I did have one pretty major hiccup with an egg roll dish involving phyllo dough. That stuff is HARD to work with, by gosh. I just didn’t leave myself enough time, and phyllo is NOT the kind of ingredient that cooperates in high-stress situations. So, the chorizo-goat cheese-chive filling ended up making some darn fine omelets the following morning, and I resigned myself to master phyllo dough some other day. Thank goodness refrigerated pie crusts are more friendly and forgiving, as I really wanted to have at least one “filled pastry” kind of dish. 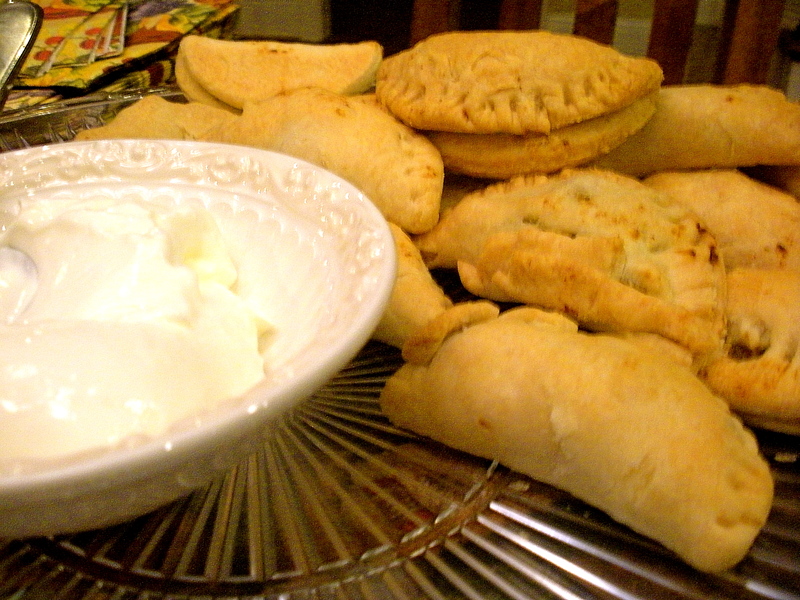 These empanadas were relatively straightforward to make (the filling in particular was quite simple, and it definitely made the kitchen smell yummy), and even though they required a little time and concentration to fill and shape, the oohs and ahhhs and “you MADE those?!? !” comments definitely made the extra effort worthwhile. They really were delicious, and everyone had fun guessing what made them just a touch sweet (it’s the cinnamon). A couple of notes: 1) You have to find your own happy zen place in terms of how thin to roll the pie crusts. You want them to be thick enough to hold in the stuffing, but you don’t want them so thick that the dough overpowers every bite. I think after making one or two, you can easily figure out what works and what doesn’t. 2) If you don’t have cookie cutters, just use the open end of a water glass. 3) Yay, you can put these together ahead of time and then freeze them until you’re ready to bake! Just assemble them, freeze them flat on a baking sheet lined with parchment paper, and then transfer them to a Ziploc bag once they are firm. When you bake them from frozen, just adjust the time to more like 30-45 minutes. Heat oven to 375º F. Heat the oil in a large skillet over medium heat. Add the onion and cook, stirring occasionally, until soft, 5 to 6 minutes. Add the beef and cook, breaking it up with a spoon, until no longer pink, 3 to 4 minutes. Stir in the raisins, ketchup, cinnamon, ½ teaspoon salt, and ¼ teaspoon pepper. Using a 2½-inch round cookie cutter, cut out circles from the piecrusts. Divide the beef mixture among the circles, brush the edges with water, fold in half, and press with a fork to seal. Transfer to a baking sheet and brush with the egg. Bake until golden, 20 to 25 minutes. Put the sour cream in a small bowl and sprinkle with the lime zest. Serve with the empanadas. Whew, sorry to leave y’all hangin’ there…life kind of got in the way of blogging for a hot minute, but I do want to continue sharing my cocktail party recipes and stories. Here goes! Since my first couple of cocktail party “courses” consisted of nuts and dips, I wanted to bring something out next that was a bit more complex, both texturally and flavor-wise. These crostini were incredibly easy to prepare, but they had great visual appeal, and their salty-acidic crunch was a refreshing counterpart to the rich and creamy dips. I am normally wary of fennel, finding its anise flavor a little off-putting (mostly since I don’t care for licorice). However, this slaw was nicely balanced, largely due to the citrusy notes of the lemon and the parsley. It really only took me a few minutes to put this platter together, and the dish did a good job of refreshing everyone’s palates. Heat oven to 375º F. Place the baguette slices on a baking sheet and brush with 2 tablespoons of the oil. Toast until golden, 10 to 12 minutes. Meanwhile, in a small bowl, combine the fennel, parsley, lemon juice, the remaining tablespoon of oil, 1/4 teaspoon salt, and 1/8 teaspoon pepper. 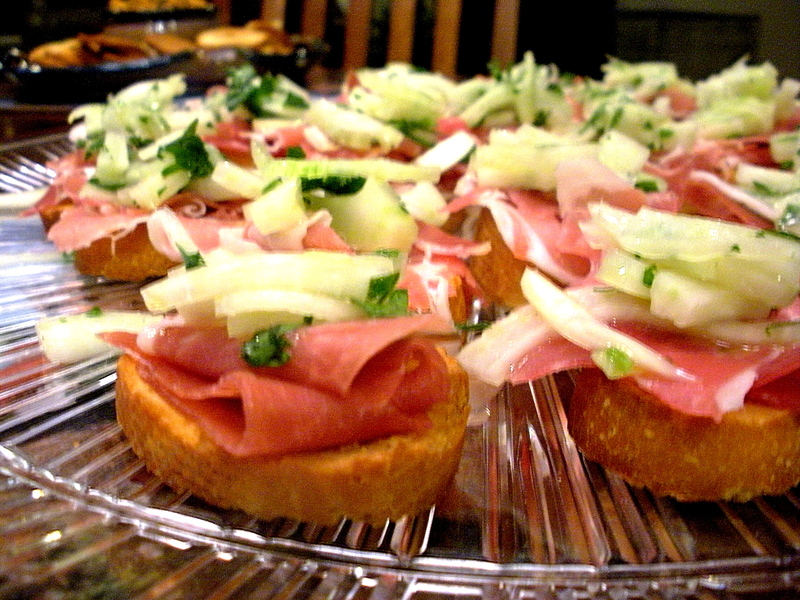 Divide the prosciutto evenly among the toasted baguette slices and top with the slaw. Greetings from Salt Lake City! I’m over here in Utah, trying to stay warm in the snow (yes, snow…ugh). So, there will be no Top Chef recap till much later in the week, and posting will continue to be light. In the meantime, though, since it is almost time for Halloween, here’s a tasty and easy recipe for a very nice fall treat. The recipe came from Real Simple magazine, and the cupcakes were a hit both at the Eat on $30 wrap party AND my office luncheon. Enjoy! After all the discussion about the Omnivore’s Hundred, much of which revolved around how much curry is too much, I suddenly had a craving for Indian food. This curry-esque recipe was simple, made my kitchen smell yummy, and was pretty tasty to boot. Unfortunately, I had to omit the fresh basil, as the bunch that I bought earlier in the week was no longer edible. The dried version just didn’t get the job done, but otherwise, I’d say this was a successful one-skillet dinner. Heat the oil in a large skillet over medium heat. Add the onion and carrots and cook, stirring occasionally, until soft, 6 to 8 minutes. Add the garlic and curry and cook, stirring, until fragrant, 2 minutes. Add the rice, 2 1/2 cups water, 1/2 teaspoon salt, and 1/2 teaspoon pepper and bring to a boil. Reduce heat to medium-low, cover, and simmer for 15 minutes. 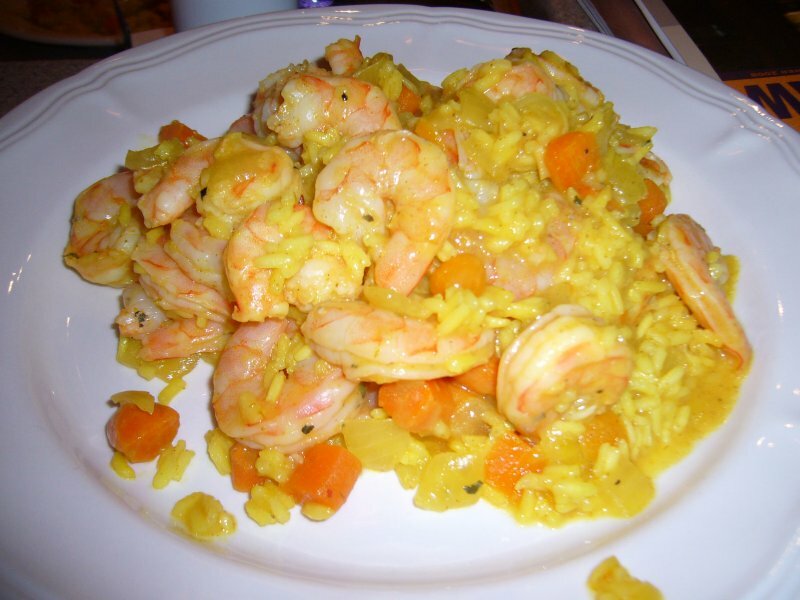 Season the shrimp with 1/2 teaspoon salt and 1/4 teaspoon pepper and nestle them in the partially cooked rice. Cover and cook until the shrimp are opaque throughout, 4 to 5 minutes. Fold in the basil and serve.